Tomorrow evening sees the last of the RSGB Centenary talks at Wythall Radio Club. A multi-wire Cage Antenna 36″ in diameter – you don’t see many of these around today! During this year we have been following the presentations produced by our national society in re-visiting its first hundred years of existence. 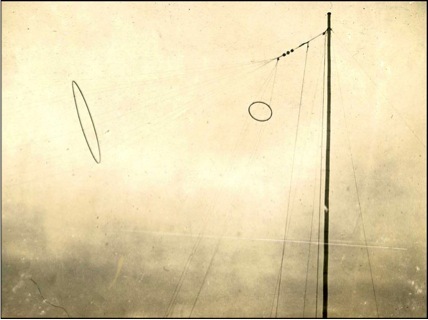 So far we have looked at how the RSGB came into being and the role of the early amateurs in wartime; we saw how the race to cross the atlantic with amateur signals unfolded, and tomorrow we will take a look at the history of amateur antennas. The presentation starts at 2030 in the Club Shack in the basement of Wythall House, Silver Street, Wythall B47 6LZ and visitors, including you, will be very welcome! Wythall Radio Club is pleased to announce that we are putting up some brand new antennas to replace the old ones on the club mast. We can’t wait to try this monster out! The antennas at Wythall House have been showing their age a little in recent times – they have served us well for about 25 years though! A decision was taken earlier this year by the committee to completely strip the mast down and rebuild it with new antenna and cabling. 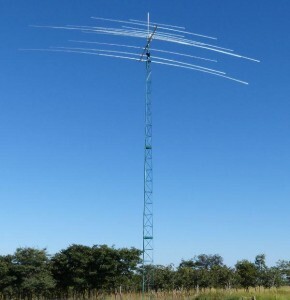 With the help of our friend Justin at Innovantennas, we are now the proud owners of a new 9 element HF array, a 6m/4m Dual Band Yagi, a 13 element 2m beam and a 19 element 70cms beam. Martin at Martin Lynch & Sons has helped us out with a discount on our new Heavy Duty Rotator and Westflex cable runs, so we are good to go. Now for the fun part – finding the volunteers to spend a weekend stripping down, cleaning up the mast and rebuilding the antenna tree! As reported recently, all six of Wythall Radio Club’s Intermediate candidates passed their recent exams and they have now been getting news of their new callsigns! 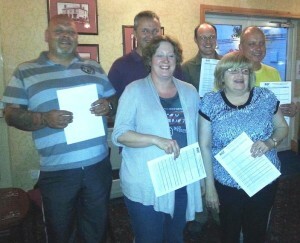 Club Secretary Anita was the first to get hers – she is now 2E0DUO. The others followed on quickly, so we are pleased to report that Kevin M6NCO is now 2E0NCO; Darren, who was M6UDM, is now 2E0UDM and our other lady candidate Dawn M6UDY now holds the callsign 2E0MIS. Craig has confirmed that he is 2E0DEM but we await news on our other Kevin (formerly M6KOR). Our heartiest congratulations to all the new Intermediate licence holders. 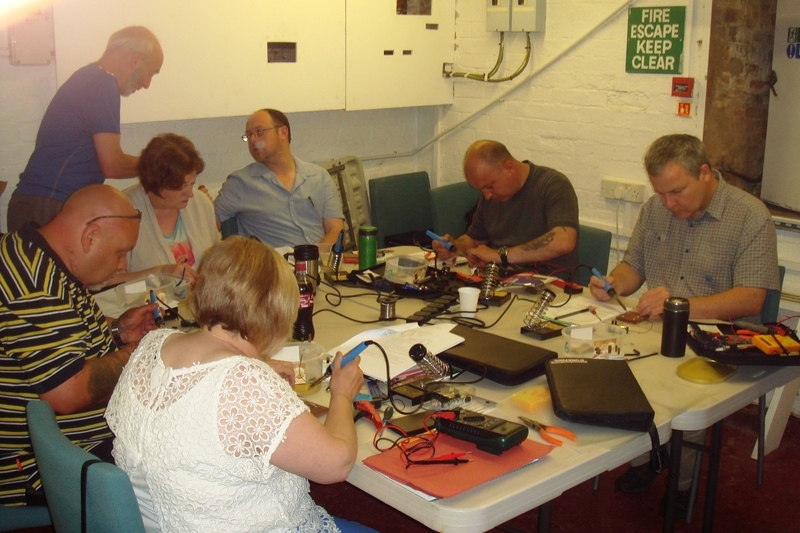 With Wythall Radio Club’s next Advanced class starting early in September, we suspect there may be quite a few people back in Training Co-ordinator Chris G0EYO’s classroom working toward the final exam. In fact, there is a pretty well-substantiated rumour that all 7 places on the Advanced may have already been taken before the course has even been advertised! Phew! Wythall Radio Club is pleased to welcome one of our Intermediate members, George Ifrim, to the ranks of the Advanced licence holders! 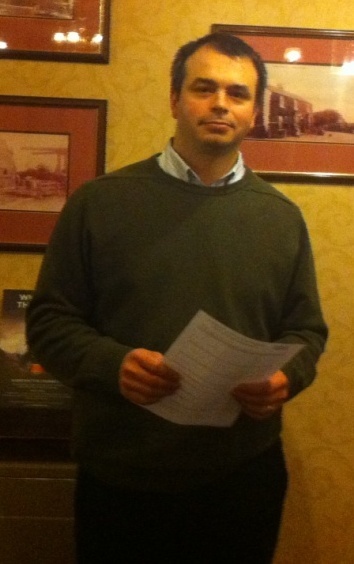 George is originally from Romania and it should not be underestimated how difficult it is to study for the Advanced using English as a second language. He was so keen to progress in the Amateur Radio Licensing Scheme that he took lessons as quickly as he could and we are very pleased that he now has his new callsign, M0HQV. Work commitments mean that George is not always available to visit the club as often as he would like, though we always enjoy seeing him when he does appear, such as at our last Friday Social meeting. From all the members of WRC, well done George! Meanwhile, our 6 Intermediate class students have all passed their exams with flying colours and we are just awaiting their new callsigns. More news on that very soon! Online Foundation Course starts soon! Wythall Radio Club is pleased to announce that we are running our second on-line course for those seeking to gain their Foundation licence. It is planned to start on the 14th July and be completed by 14th August. We think this might be ideal for younger students or those who cannot make a regular classroom attendance on our normal teaching nights. Students can study in their own time with support via posts from the tutor. However it is essentially a course requiring a large amount of reading that you do unsupported so if you need special assistance because of any disabilities then this course may not be for you. 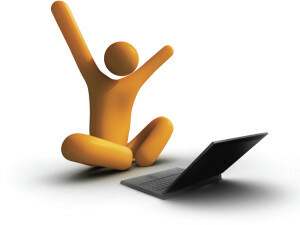 The on-line course is open to those anywhere in the country who can access a registered exam centre. Exam Night for the Intermediates! The members of Wythall Radio Club have their fingers crossed for our latest batch of recruits to the hobby of Amateur Radio. It’s almost time for the Intermediate Exam for 6 of our Foundation Licence holders. Over the past few weeks they have been very busy completing their practical assessments and studying towards getting the next stage of the licence. And if they are successful, Wythall Radio Club will be welcoming a new batch of 2E0 callsigns coming our way very soon. So it’s congratulations to all of them on finishing the course – now we wish them all the best for the exam tonight (Monday) – we hope to have news of some new callsigns within a week or so! This year’s Wythall Fun Run took place yesterday (Sunday morning) around the village. Despite the name, it’s a pretty serious event with 1.5 km, 5 km and 10 km courses attracting some even more serious entrants! Checkpoint Anita M6DUO! She tells us she enjoyed watching fit young men running past her… Well! For the members of Wythall Radio Club though, it was an opportunity for fun of a different kind! 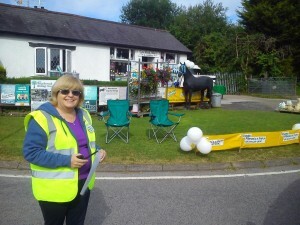 This year we were asked by the organisers to help provide communications for the event. So some of us took a break from our Field Day event to go and help make sure the Fun Run went without a hitch, which it did! Wythall Club Member John M1JSS rallied the troops into action – all those some folks along the route with handie-talkie radios or perhaps sitting in their cars handling communications traffic for the event were all Club members, having fun with RF in yet another guise! And it’s really quite satisfying to use our love of radio communications to put something back into the community!